How do you explain to a child the death and destruction that happened to our country on 9/11/01? I take myself back to that day. Barry and I had been married for less than a few weeks. I was on my way to work that morning to a vet supply company and I turned on the radio. I heard a news report and turned it to another channel...channel after channel told me that 1 plane had crashed into the world trade center. At first I thought, with most of our country, that it was an accident. That it was a pilot error..I mean after all, cold calculating things like 9/11 did not happen in America. I continued to work and sat down in my chair...when the radio announced another plane had crashed into the other tower. At this point we all knew that we were under attack. I listened through out the morning hoping for more survivors and listened as another plane...then another crashed. I listened as our whole air space was shut down to a grinding halt. For lunch I rushed home to see the news footage and watched as those planes hit the towers...over and over again. It was if it was out of a Hollywood movie. It just seemed so unreal. The next few days I watched as our country introduced it's first ticker tape below a news segment and now terror levels. The names of those that perished or remained missing scrolled across the screen. One really hit me hard. I heard the story of a Mom and her daughter on one of the planes that hit one of the towers. It just made sinking feeling in the bottom of my stomach. I didn't have children then and could never comprehend a Mother's love until now...I can't imagine how that Mother clung to her child and probably whispered great things in her ear, to encourage her little one...knowing they were fixing to hit a building and their family would be no more. Another story of a Father who had moved with his wife and children. He was on his way home from simply picking up their family pet...just doing something great for his family turned fatal. Then there came the news reports that horrified me that day on 9/11. The one that will stay in my mind forever as I watched live. The WTC jumpers. The poor people who were pounded by fire and smoke..realizes their only escape routes were cut off and so was hope. The heat had forced them to window's edge and later to jumping to try to escape it. I watched as one went and then...a man and woman grabbed hands...they jumped. I couldn't believe what was happening to our fellow Americans. They were going to work to make a living for their families and here they are holding hands with a co-working and being shoved out the window by heat. How did it come to this? I am 32 years old and was 22 on that date. I still can't understand how someone can do this to our country. I still cry when I read articles on those that have passed away or footage of the buildings demise. Just to know that almost 3,000 people lost their life that day..just doing their everyday job or traveling to someplace special, is unfathomable. So today came that question from my 6 year old as I was watching a 9-11 memorial service. She wanted to know what happened and why is it on so many channels? I cut off the TV and asked her could she handle a sad story? She told me she could and curled up with a blanket...my youngest playing with a doll next to me smiling that a story was to be told. I used my fingers as the towers and she copied me. I began to tell her that there were some men who didn't like our country. She immediately identified them as bad men and I even wonder is this the correct term to use? I explained to her how they stole planes with people on board with the intent to hurt others. She wanted to know where did they steal these plans from and how could they just get in the and fly off. It just seemed like a video game to her. I told how the first plane crashed into the first tower and she waited eagerly of hearing all the people ran outside. When she asked I sadly told her not all survived. I was getting choked up by now. I explained how the second plane hit the second tower. I described to her how the firefighters and cops came to rescue everyone. She began to ask about paramedics and those from the hospital (her Daddy is a MRI tech and she loves visiting the hospital where he works.) 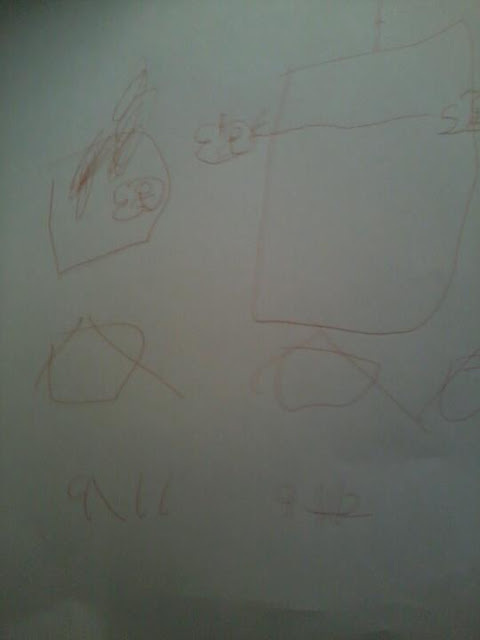 I explained how they did and then I had to tell her how the towers crumbled. I used my fingers to bring my fingers down slowly and she did. When she reached the bottom, she realized there were no towers left. She immediately asked to see a picture of what the towers looked like before the attacks and so I got online. I showed her the towers of how they looked. It saddened my heart that this would be a place she could never visit or stare at in awe. I talked about the top floor and how one tower had a restaurant. She looked down and wanted to know where did the planes hit...I pointed. It clicked then. She said "Mommy, how did they get off the top floor?" I told her they didn't. That all their escapes had been damaged due to the planes and there was no way out. She asked were there rooms of smoke and I told her yes. She asked about the firefighters, cops, and others people that were in the buildings when it crumbled. I told her that most did not make it. I thought for a minute she was going to cry when she asked about the hospital staff. I assured her that they were waiting at special areas for the injured...I could tell she was worried about her Daddy. It just really hurt to tell her about 9/11. Ten years later and I don't think I am over it or ready to really talk about it. I didn't tell her all the things I have seen or heard. The phone calls they played of those calling 911 or calling their loved ones. I didn't tell her of the emails sent that they were okay, when really they didn't know about the second plane. Most of all...I didn't tell her about the jumpers that have always bothered me. When I think of 9/11, I always think of Kevin Cosgrove and probably always will. I didn't know him. I only heard his 911 call and it's forever etched in my heart. I could picture him calling his wife and telling her he was okay, only to find himself trapped with others as the towers collapsed. Here's his recording and I will be honest...it is graphic. After all was said I let her ask questions. She then asked could she draw a picture and above is what she drew. I first thought it was people falling out of the building, that gave me an eerie feeling, but she told me that were the men flying planes into the building. She also noted the top of one building. She was very fascinated in what looked like an antenna coming from the top. I'm sad she and Emma will never get to visit or marvel in the architectural structure that is the TWC. It was always something I wanted to visit as a kid and never got to. Now I think I would be a little fish in a big pond in the big Apple. My time has gone, but theirs is just beginning. On a side note, I am appalled at the lack of children's material on this subject. When I searched google...I found nothing. So for everyone...I want to say..I am so sorry for the loved one you are missing to today. It was a unthinkable tragedy I wished never happened in our history. My heart and prayers go out to you. May God bless America on this day!